Cartoon settings are only changed when explicitly specified; there are no command defaults, only initial default settings of a structure when it is first opened. Changes only apply to models that are already present, not those opened later. The factor controls the balance between smoothing peptide β-strands versus following the exact positions of the α-carbons (initial default 1.0 maximally smoothed, ranging to 0.0 for unsmoothed). Specifying default instead of a numerical value sets the value to 1.0. Smoothing applies only to peptide strands, not to helices, coil, or nucleic acids. Lower values may be desired for strand residues with sidechains displayed, to preclude showing tethers. Whether showing cartoon for a residue suppresses the display of its backbone atoms (initial default true). 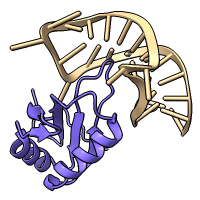 The backbone atoms suppressed by cartoons are N, C, and O in amino acids and P, OP1, OP2, OP3, O5', C5', and O3' in nucleic acids. Simultaneous display can be enabled by setting this option to false. Connecting tethers are drawn where displayed backbone atoms are offset from the cartoon. Peptide residues at the beginning or end of a secondary structure element (SSE) are given the same orientation as the adjacent residue in that SSE. 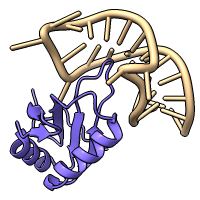 The depiction of a peptide helix or strand starts at the CA atom of its first (N-terminal) residue and ends at the CA atom of its last (C-terminal) residue. The cartoon style command controls secondary structure representations, width, thickness, and shape (see examples above). Given without options, it reports the current settings for each atomic model. The following options can have different values for helix, strand, coil, and/or nucleic in the same model (and these words can be used in the atom-spec). Conversely, a blank atom-spec indicates all applicable models and secondary structure types. The width w and thickness t are given in Å. The width setting does not affect coil, however, as only its thickness is used in both dimensions. The initial default width and thickness are 2.0 and 0.4 Å, respectively. The xsection or cross-sectional shape of the cartoon can be oval (synonym round), rectangle (synonym square), or barbell with rounded edges and a thinner middle (synonym piping). The barbell cross-section does not apply to coil and does not affect arrowheads. 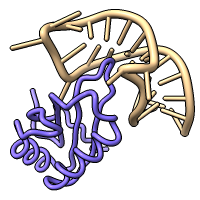 The initial default cross-section is oval for helix and coil, rectangle for strand and nucleic. 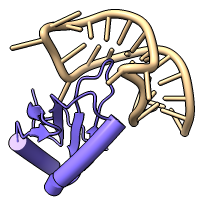 The modeHelix option allows showing peptide helices as tubes (curved cylinders) rather than as ribbons spiraling along the backbone atoms (initial default). Spiraling ribbons from the wrap mode wrap around the calculated tubes, whereas those from the initial default mode are oriented as described above. Helix tube calculations use α-carbon coordinates. For a helix of 6 or more residues, a straight tube axis (first principal component) is used if it gives a low average distance to the α-carbons; otherwise, an arc (circle segment) fit to the α-carbon coordinates is used instead. For a helix of 3-5 residues, the axis of an idealized α-helix fit to the α-carbons is used. Increasing the number of sides from 12 is recommended to give tubes a more rounded (smoother) appearance. Other than radius and sides, most helix settings such as width, height, cross-section, and arrows do not apply to helices in the tube mode. For peptide helices in the tube mode only, a constant radius r can be specified, otherwise (auto, default) a radius will be determined separately for each helix according to the average distance of the α-carbons to the tube midline, capped at a maximum of 2.5 Å. Where a displayed α-carbon is offset from the tube surface, a tether will be drawn. Whether to show arrowheads at the C-terminal ends of peptide strands (initial default true). Whether to show arrowheads at the C-terminal ends of peptide helices (initial default false). The factor (initial default 2.0) is multiplied by the width of helix or strand to give the arrowhead width. The number of straight-line segments used to draw a barbell cross-section (initial default 18). Odd values of barSides Nb are automatically rounded up to the next even number. The factor (range 0.2–1.0, initial default 0.5) is multiplied by the thickness to give the central “bar” thickness of barbell cross-section relative to the edges, where the nominal value applies. A tether is drawn between a displayed α-carbon (CA atom) and the corresponding cartoon segment where they are offset, such as in smoothed strands or helix tubes. Tethers are also drawn for displayed proline N and nucleic acid C3' and C4' atoms, and when backbone suppression is turned off, additional displayed backbone atoms. The sides option controls the number of planar facets used to draw a tether (range 3-10, initial default 4). The scale option sets tether base radius relative to the display radius of the corresponding α-carbon (range 0.0-1.0, initial default 1.0). The tether color tracks the color of the corresponding α-carbon. The tether opacity value (1 – transparency) can range from 0.0 (completely transparent) to 1.0 (completely opaque), with initial default 0.5. Tethers can be hidden using opacity 0.